We can fit electric gates, doors or barriers of any type for your property. Using our skills and experience we can create a suitable electric gate design specifically to meet your requirements. We can tailor our service to develop for you the most suitable electric gates for your property. You may already have gates installed at your home or business and think it’s too late to get an automated system. We can show you why this is an incorrect assumption to make. Call us at Castle Doors & Gates for advice. We will visit your property and determine whether existing gates can be upgraded to become electric and automated. 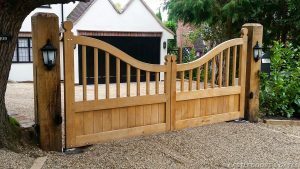 Our service includes all aspects of the design and fitting of your automated gates, whether they are sliding or swinging. We will work in accordance with your requirements to create the automated gates you want. We have great experience in the electric and automated gates and doors industry. We have been installing electric gates and barriers for happy customers for many years. Automated gates provide you with the convenience of operating the barriers remotely, whether you’re leaving or entering the premises. You therefore do not need to leave your vehicle – potentially a great help if it is raining or you have a physical ailment. Electric automation goes beyond just the action of the gates – we can install an intercom system that will help raise the security of your property. You don’t have to contend with manually opening and closing the gates when you come to us for the installation of an automated gate. We will demonstrate how they work and offer an aftercare service should you require any further assistance. Being Flexible is important to us. This allows us to determine the most convenient time to carry out your installation and ensure that you are happy with the result. Our made to measure designs will meet your requirements in style, purpose and operation.